You are here: Home>Police History>Police Stations>Eynsham Hall Training Centre, Witney, Oxon. I recently visited Eynsham Hall, Witney, Oxfordshire which is now a hotel. Externally it appears the same as it did when my father did his police training there in 1950 and when I did mine in 1962 with refresher courses in 1963. The inside is much altered but the place brought back plenty of memories. You cannot parade on the front driveway to the tune of Colonel Bogey anymore as there are small trees in pot and a roundabout by the main entrance. The picture should bring back memories for those who also did there training at this location. I attended Eynsham Hall on course number 1/1976 from January to March. I remember 1 recruit turning up being shouted at and just drove off never to be seen again! A punishment for a minor discretion was coffee with the deputy! Great memories all too long ago! I was at Eynsham Hall from December 1968 to March 1969 before being posted to Reading (TVP). My class instructor was Fred Timms who I remember with fondness. Yes Malcolm Dalrymple was PTI and First Aid instructor, he had some wonderful aid memoirs especially when it came to slow marching and ruptured spleens!!. I left TVP in May 1973 later joining Lancashire and retiring in May 2001. Most of the TVP officers didn’t last long in the Police either moving on to other forces. I think a lad called Paul Wicken PC 2020 (AKA Duckhams was with TVP for the duration. No longer have any contact them. Lost the course photo too, would be nice to get a copy will lool on the Bucks Police and Facebook. I thought the drill sergeant was called Fred Fulford not Fuller. The brilliant PTI was Sgt. John Cardwell from the City Of London. he was one great swimmer. The deputy commandant as I recall was a guy with the surname o.f Warwick. It’s funny how names stick in the memory, I was there 1966/7 does anyone remember a recruit from Bedford Police by the name of Alan Melbourne Willey? I also trained here as well 1970 ? Sgt Fred Timms was class instructor and Sgt Malcolm Dalrymple was the PTI. Both were great men. I was at Eynsham from August to November 1966 as a recruit with City of London Police. The PTI was Sergeant Cardwell of City of London Police who was a great swimmer. I remember the drill sergeant Fuller. A great character. When we were at ease he would march along the ranks telling jokes. The Commandant looking from the upstairs window was unaware! I was there in 1974 scared to death when I arrived and the drill pig Jones didn’t help but after 12 weeks I didn’t want to leave met some truly great blokes who helped me get through it wouldn’t have missed it for the world hope you are all still sane. There is a Facebook page Eynsham hall, No 5 DPTC. I attended Eynsham Hall on 2nd September 1974 as an Essex Pc amongst a class representing several Forces including Hertfordshire. I recall Adrian Tapp and (I believe) Dave Collinson who happened to visit me at Harlow one evening when I was on duty (and before they were ‘hitting the town’). I wasn’t the most aspiring of students and also finished with the tail-enders on that cross-country run, nevertheless, I got through it all unscathed. I recall the morning parade, everyone called to attention in one long line and those who failed the weekly exam having to be ‘retarded’ (sent back one week) should they have failed the midweek re-test. It’s all so long ago now, but I clearly remember it all as though it was only last week and would love to speak with anyone who might want to resurrect the past. I attended eynsham police college from July till October 1969 . I remember Sgt. Blewitt ,drill Sgt, I thought he was brilliant at his job, also very tough p.t.i. Sgt . Caldwell, City of London . I found training very hard but I enjoyed it , in fact I would not have missed it, Sgt. Alcraft was our training instructor, I think the main task of the instructors was to try and walk the drive to leave, but made you more determined. J. Green Essex &Southend constabulary.. I was there February to May 1960. Course 163, I was in Beds Constabulary, Tutor was Sgt Fretton (Essex). Drill Sgt Gorham (Beds) PTI was from Bournemouth Borough. I see from previous comment that all but one relate to late 60s and more recent. My time there was in 1956 and whilst memories of some instructors are vague their antics are easily recalled. My thoughts hark to the Friday x country run followed by fish and chips with treacle suet pudding and later permission to smoke was signalled from the top table. The afternoons that followed were a struggle to stay fully awake. My chief offence was to visit a nurse in nearby Freeland Hospital, cycling under cover of dark and often mist across land owned by the Masons (hp sauce fame I believe) I was never caught! Was anyone there in March 1977? A group of us will be visiting the Hotel in March 2017 to celebrate 40 years. Drill Pig was Sgt. Barker BEM (British Empire Medal). Privalidged to have attended this centre April 1972 on the same course as above mentioned Ian Dowse and his colleagues from Herts. I was from Cambs and although it was one of the toughest 13 weeks of my service looking back thoroughly enjoyed it. Sgt Jones also our drill Sgt. I was there in 1964 having served two years as a cadet in Hertfordshire and then went on to serve as a PC and DC in Hemel Hempstead, uniform Sergeant and then DS in Watford leaving the force in 1972 to go into business in S Wales. Some great memories of it all! I did my basic police training course at Eynsham Hall between January & March 1976. My class sergeants were Pete LEWIS (Thames Valley) & David DENHAM-SMITH (Norfolk) Happy Days. Wonderful memories. Further to my recent posting I should have pointed out that My Brother attended Eynsham as an East Suffolk Officer and I was Suffolk Constabulary. My brother and I both did our initial training at Eynsham his in the mid sixties and Mine in 1970. Revisiting on 1st August 2016. I clearly remember Jock Anderson who was on senior course when I had just begun my junior course. During my intermediate course Sergeant Blewitt caught me taking a short cut across the front grass area in my left hand drive Morris 1000 as I rushed to make my way home on a Friday afternoon, the punishment was I had the following weekend leave cancelled. The echo of Sergeant Blewitt standing at the main door shouting out his commands and of course Sergeant Blewitt’s first Aid training using the ‘resuscitation Annie’ dummy a true comedy act. Blewitt was the epitome of a Sgt Major! I understand from the staff at the Hall Barry Blewitt himself recently visited. I was training at Eynsham Hall for three months between November 1964 and January 1965. Sgt Fuller was the drill sergeant and Sgt Ellery & Wright were our tutors. I then was posted to Watford Central for two years after which I realised that the Police Service wasn’t for me. I remember being involved in the Harry Roberts search when he was apprehended at Bishops Stortford. I did my initial training here in 1970 (Herts). Sgt. Barry Blewitt of Beds & Luton was our drill instructor and a great bloke. Jock Anderson (City of London) was our class leader and, being an ex drum major of a Scottish regiment (Argyl & Sutherlands ?) we marched on at our final parade with Jock playing the pipes which was a terrific moment. I was here from September until December 1971 (Hertfordshire Constabulary) and I remember Sgt. Jones very well. I was at Eynsham June-Aug 1958. The USAF should have done a fly past at our passing out parade and turned up an hour late after dispersal. British Summer Time was the excuse apparently. I was there in 1976, and all the ‘Drill Pigs’ were cut from the same cloth. As a retired Beds Officer, I too remember Sgt Jones! 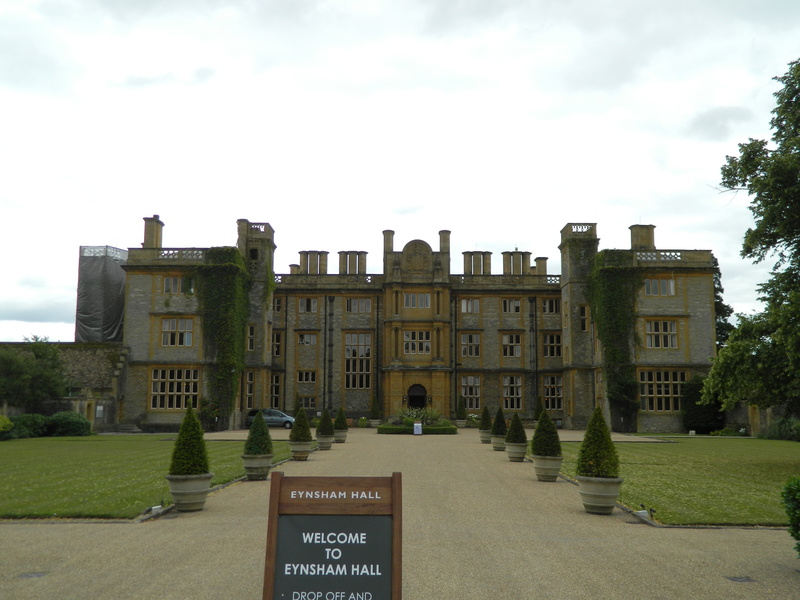 I DID MY INITIAL TRAINING AT EYNSHAM HALL IN APRIL 1958 HOW THINGS HAVE CHANGED IN POLICING OVER THE PAST 58 YEARS. I was there from Feb to May 1968 when most of the recruits were ex servicemen. There was a great PTI who could swim like a fish. I was at Eynsham Hall in 1972 and John is quite correct. Bucks. Police have an inernet site with a large number of class photos trough the years. I found my 1959 class picture. I was there from May to August 1973 having joined Mid- Anglia Police. I remember Colin Jones, the drill pig from Beds and Luton, a thoroughly unpleasant little man. I believe he had the MBE for something. I think Eynsham’s official title was Number 5 Police District Training Centre. It took police officers from most of the Home Counties and the City of London.